Drivers in Carrollton often look to luxury brands like Mercedes-Benz in for their high-end finishes and quality touches. The interior of the new GLE SUV is no different, as it comes with a cabin filled with rich design and features to uplift every moment behind the wheel. 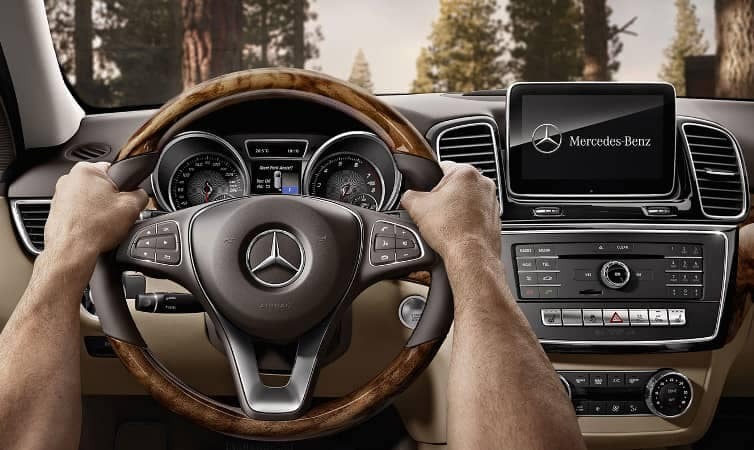 Explore the 2019 Mercedes-Benz GLE interior features when you visit Mercedes-Benz of Plano. 7-inch high-resolution color screen with Hands-Free Bluetooth®* Interface: Access contacts, place and answer calls, and more without taking your hands off the steering wheel. Bluetooth®* audio streaming Connect your Bluetooth®-equipped device wirelessly to your vehicle’s audio system to access all your favorite music from your apps. Add on optional features like COMAND® Navigation, a Bang & Olufsen® BeoSound Premium Sound System, or in-car Wi-Fi to further enhance your GLE. ATTENTION ASSIST®: This system delivers both visual and audible warnings to drivers if drowsiness is detected. PRESAFE®: The front seatbelts will tighten, the front passenger seat will adjust, and the windows and sunroof will close automatically if vehicle maneuvers indicate that a collision or rollover is impending. Wondering about the rest of the Mercedes-Benz SUV lineup? Stop by our location near Dallas to compare the models for yourself and to learn more about our finance and lease specials. You can also value your trade online and have an offer waiting when you arrive.